We are in vibrant “new” world of authentic disability representation on television, with shows like Switched at Birth, Speechless, Little People, Big World, and Born This Way. However, is this authentic representation so new? In the 1980s, several scholars evaluated authentic disability representation on television when disabled actors appeared on screen, looking at their impact on audiences. Blind actor Tom Sullivan guest starred on a number of TV shows from the 1970s through the 1990s, and researchers Tim Elliott and Keith Byrd ran an experiment to study the audience response to Sullivan’s non-stereotypical presentation of blindness in the hit show Mork and Mindy (1978-1982). In addition to viewing the episode, the researchers discussed misconceptions and stereotypes about blindness with participants. Elliott and Byrd found that the viewing and discussion of stereotypes created a nonthreatening environment for participants, allowing them to shift their misconceptions and to accept accurate information about disability. Research in the 1990s about the first TV show to feature an actor with Down syndrome, Life Goes On (1989-1993), had similar findings. An experimental study in 1999 looked at both a documentary with an independent person with Down syndrome and the Corky character with Down syndrome from Life Goes On. The research participants saw active, socially engaged people with Down syndrome and that helped counter negative stereotypes of people with disabilities. Most importantly, the participants began to see people with Down syndrome as having equal status in society. This research illustrated several decades ago that media representations of disability have the power to change audience beliefs about disability. So why does authentic disability representation on TV ebb and flow so significantly? I believe the answer has three parts. 1. News coverage of disability rights at the time. 2. The shift from guest starring roles to principal character roles. 3. The birth of reality TV. First, TV writers do not write in a vacuum. They may be writing a 1970s show about a medical unit during the Korean war (M*A*S*H, which ran from 1972 to 1983), but before they head off to the writers’ room at a TV studio in Los Angeles, they might see news stories about the 1977 disability rights protests at the San Francisco office of the U.S. Department of Health, Education and Welfare. Obviously, I cannot prove an explicit connection, but my point is that news media coverage of disability topics reminds everyone, including TV writers, that people with disabilities exist. In addition, once disability is in the mix for a plotline, other connections pop up. In the case of the TV show M*A*S*H, the blind actor Tom Sullivan appeared in an episode in 1976, the late actor William Christopher, who played Father Mulcahy, had an autistic son, and actor Gary Burghoff, who played Radar, has a disabled left hand from birth. Secondly, disabled actors working in the 1970s and 1980s who were able to get recurring roles or star as main characters on TV shows reinforced for producers that a disabled actor could carry a show. Deaf actor Linda Bove appeared on Sesame Street from 1972 to 2002, which is the longest recurring role in TV history for a Deaf or disabled person. Actor Geri Jewell, who was on Facts of Life from 1980 to 1984, became the first person with a disability to have a recurring role on primetime TV. In addition, when Chris Burke starred in Life Goes On, he proved that an actor with Down syndrome could carry a prime-time television show. Finally, as much as everyone likes complain about reality TV, it put actual people with disabilities in front of the cameras to show audiences their lives. Also, when their shows became a hit, it gave disabled people more control of the reality shows that featured them. One of the first versions of the modern reality show, The Real World on MTV, featured in 1992 an actual person with an HIV/AIDS diagnosis, Pedro Zamora. President Bill Clinton credited Pedro Zamora with helping lessen the fear people had of those with HIV/AIDS. Little People Big World (LPBW), which chronicled the lives of the Roloff family in Oregon, premiered on TLC in 2006. The parents, Amy and Matt, both have dwarfism, as does one of their four children. Amy Roloff said in 2010 that when they were approached about doing the show, they saw it as a good way to educate the general public about dwarfism. “Nothing had depicted dwarfism in an everyday way,” she said. LPBW ushered in a number of reality shows about little people. Although mostly viewed as positive, some have criticized these shows as playing into TV audiences’ voyeurism about people with dwarfism. The success of the show led to more than just reality shows about little people. Little People Big World’s producer also created Push Girls for the Sundance channel, a 2012-2013 reality show about four Los Angeles women who are wheelchair users. These reality shows had good ratings and proved to TV executives that TV audiences are interested in lives of people with disabilities, whether they have a connection to disability or not. 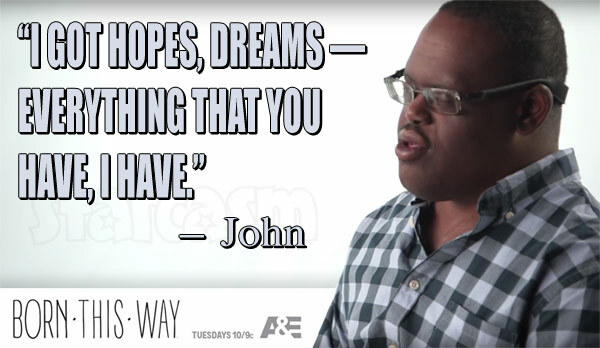 These reality shows are the ancestor of the hugely successful current reality show Born This Way on A&E (2015-present), which features adults with Down syndrome gaining independence and navigating friendships, employment and romantic relationships. During its first season, it increased its ratings by 85%, which was the highest rating increase in A&E’s history. The show also won an Emmy for Best Unstructured Reality Series in 2016. Murray, who was a producer on MTV’s The Real World, says Born This Way is more real and authentic, and the production team could not use the typical reality show “tricks” to create drama. “We sort of knew we had something very genuine and very authentic … had to go back to that and trusting the emotion of the scene and that the emotional connection viewers would have with the seven adults would carry through to commercial, and that’s very different,” Murray told Deadline in 2016. Good television begets more good television, so it is my hope that the ebb and flow of authentic disability representation is over, and the stories of actual disabled people, with authentic casting and plotlines, will become a permanent part of the television landscape. Elliott, T. R. & Byrd, E.K. (1984). 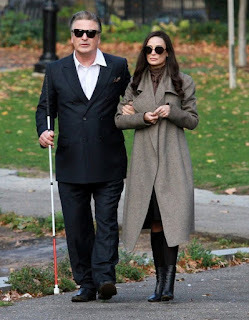 Video Depictions of Blindness and Attitudes toward Disability. Journal of Rehabilitation. Jan-Mar84, Vol. 50 Issue 1. Hall, H. & Minnes, P. (1999). Attitudes toward Persons with Down syndrome: The Impact of Television, Journal of Developmental and Physical Disabilities, Vol. 11, No. 1. The Ruderman Family Foundation, a leading organization advocating on behalf of disabled people, has come out against the forthcoming film “Blind.” The group accuses the movie of “crip-face” — akin to blackface — in its casting of the able-bodied Alec Baldwin as the blind lead. “Blind,” which Vertical Entertainment will release July 14, stars Baldwin as a novelist who lost his wife and his sight in a car crash. Years later, he comes into contact with a married socialite, played by Demi Moore, who is forced to read to him as part of a plea bargain. The two begin a love affair forcing Moore’s character to choose between the novelist and her husband. Last July, the foundation released its Ruderman White Paper on Employment of Actors With Disabilities in Television. The study found that despite those with disabilities representing nearly 20% of the country’s population, about 95% of characters with disabilities on television are played by able-bodied actors. Months later, in November, the organization hosted its first Studio-Wide Roundtable on Disability Inclusion. At that event, Marlee Matlin, perhaps the most visible and acclaimed disabled actress, spoke about the need for Hollywood to give disabled actors a chance.